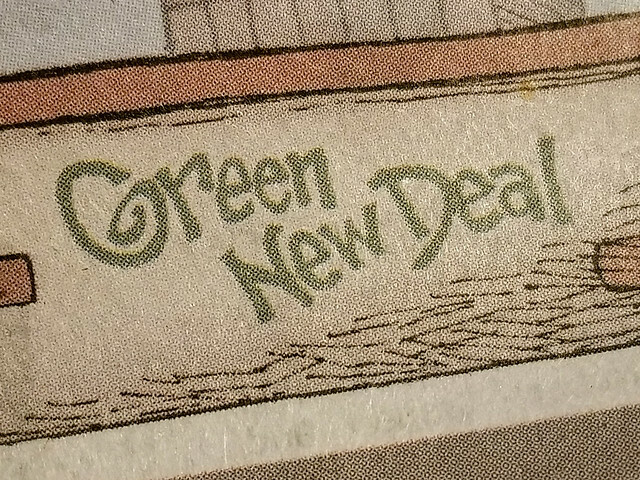 The 14 page proposal for a Green New Deal submitted to the US House of Representatives by Congresswoman Alexandria Ocasio Cortez does not actually mention Modern Monetary Theory, but that is the approach currently capturing the attention of the media—and taking most of the heat. The concept is good: abundance can be ours without worrying about taxes or debt, at least until we hit full productive capacity. But the devil is in the details…. Ellen Brown is an attorney, founder of the Public Banking Institute, and author of twelve books including Web of Debt and The Public Bank Solution. A 13th book titled Banking on the People: Democratizing Finance in the Digital Age is due out early next year. She also co-hosts a radio program on PRN.FM called “It’s Our Money.” Her 300+ blog articles are posted at EllenBrown.com. This article was first published on Truthdig.com. This entry was posted in Capitalism, Economy, Europe, Federal Reserve, Politics and tagged Debt, Ellen Brown, Green New Deal, MMT, Monetary Reform, Public Banking, Quantitative Easing. Bookmark the permalink.